The Cape is a new boutique hotel in the heart of Cabo. We love the contemporary design and variety of locations in the hotel to make wedding photographs. The luxurious lobby bar looks out to an unobstructed view of beautiful Lands End; one of the only wedding venues in Los Cabos to boast such a sweeping vista. The Glass Box, designed by renowned architect Javier Sanchez, is a bar that looks exactly like its name; its lounge is perfect for relaxed wedding portraits. The dark colors, strong lines, and sharp angles throughout the hotel give it a very distinctive look. 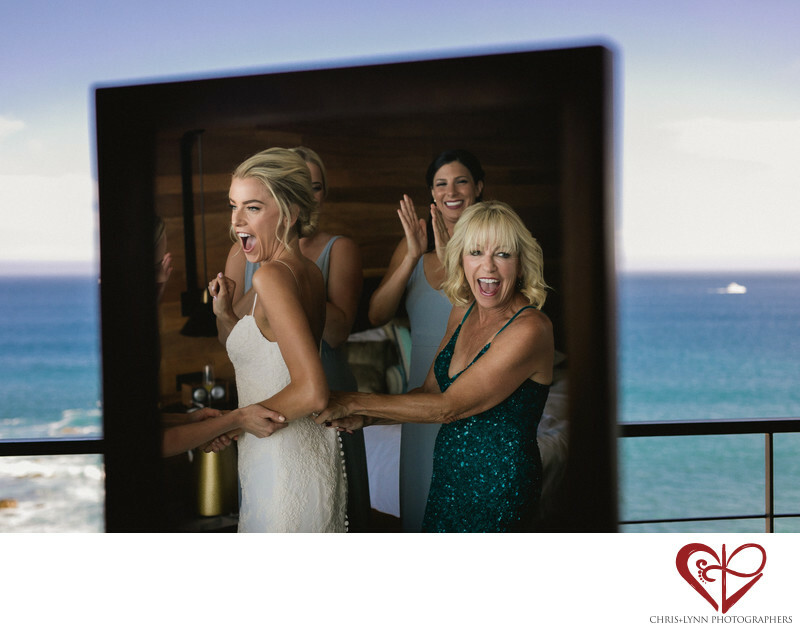 At this Cabo wedding, the bride got ready in a room with an ocean view. As her mother was adjusting her dress, her bridesmaids came in to give her some words of advice and encouragement before the ceremony. To capture this interaction between mother and daughter reflected in the mirror, Chris used his Sigma 35mm f1.4 Art lens to keep the intimacy of the moment and incorporate the blue sky and ocean into the image. View more images from this couple's wedding at The Cape Hotel on our website here. 1/1600; f/2.8; ISO 400; 50.0 mm.